To close the women's soccer team's regular season, first-team all-conference junior forward Mackenzie Cowley overcame a midseason scoring funk to net the game-winning goal in each of the Colonials' final three games. On a wet and dreary November afternoon, Ms. Cowley met GW Magazine to discuss how she did it, whether it can be taught and how she'd like to climb Everest for the bumper sticker. 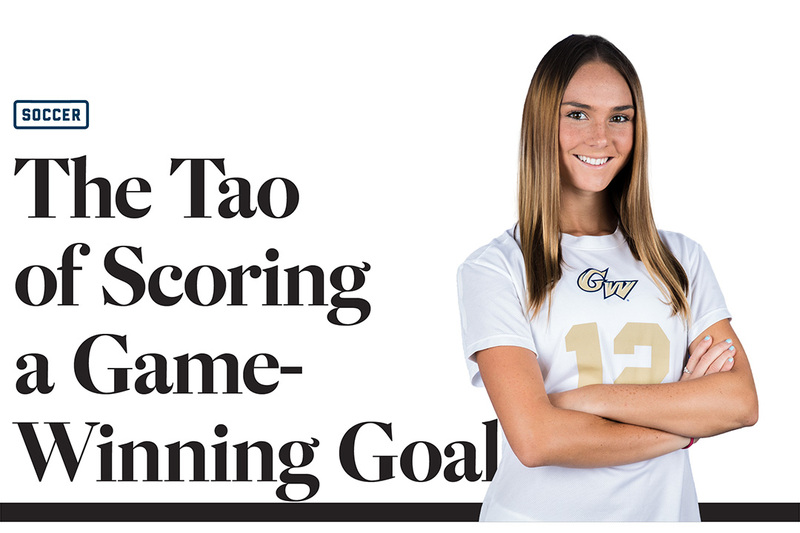 GW Magazine: Can you train yourself to score game-winning goals? Mackenzie Cowley: No, I don't think so. GW: So is this something that's innate? MC: My whole life, everyone's said: You're not a soccer player, you're a goal scorer. It's so true. You give me a soccer ball—I can't even juggle, you know what I mean? It's sad. I don't have the foot skills. I don't have that, but I have something in me—I have like a knack: I can score goals, which is pretty interesting because a lot of people, if they're in that situation, would crack under pressure. I've heard people say when they get in front of goal they get nervous. They'll hit it wide, just kind of panic. But I kind of notice when I'm in front of goal, I just have the confidence to know exactly where I'm going and I put the ball right there. GW: Do you enjoy that? MC: It's my favorite feeling in the whole world. GW: What does it feel like? MC: It gives me confidence, and I guess because I've been able to do it before, I know I'm able to do it [again], so it's just exciting when I get in those situations. I have the confidence in myself to go and put this ball away, and we're going to win the game because of that. GW: Does your heart beat faster? Do you relax? Do you briefly phase into a parallel dimension? MC: I don't really remember what's happening because I just focus on putting the ball in the net. I don't hear anything. My parents will be like, "Oh, did you hear us?" And I'm like, "I hear nothing." I'm in my own zone with the goalie and the ball. GW: Do you remember the first time you went in your "zone"? MC: I've always had it and it's just always been the same thing my whole life. I've just been able to calm myself and put the ball in the net. GW: Does any of this bleed over into your non-soccer life? GW: So your connection to the Soccer Force dies? MC: It dies. I wish it was in [regular] life. That would be awesome. But I'm very intuitive. That's one thing I've noticed. I always have a gut feeling about something, and it's usually right. MC: I was in Greece this past summer, and me and my friend were walking out to dinner, and I was just like, "Something is just not right. We should go back." ... Something was just weird and, literally, there was a riot that was going on a couple blocks away ... and I had no idea. There was absolutely no sign of anything. It was quiet—it was too quiet. I was just noticing there weren't really any cars. There was usually traffic. GW: Do you have any other talents? MC: I can wiggle my ears. GW: What about secret dreams? I've always wanted to learn the "Thriller" dance, tell no one, then break it out at a wedding. MC: I was thinking maybe I want to climb Mount Everest. MC: I heard that there's a potential that you won't make it. GW: Yes, there's a very large one. MC: But I think it would be kind of interesting. GW: Maybe you could start with a smaller mountain. MC: I'd probably have to train myself to do it, but I feel like it would be a really cool accomplishment to say that I've done it—like really cool, like a bumper sticker on my car. GW: I'd at least get a tattoo. MC: Oh, you'd have to. Alumni, former coaches and others look back at the moments that mattered.